Shakespeare’s King Lear in the last decade has been performed frequently. Perhaps this is because the elements in the play have currency. The titular character appears to suffer from a malady that increasingly our aging population faces, Alzheimer’s Disease and/or dementia. Lear unwittingly relinquishes his power and authority to his undeserving and malignant daughters and their husbands, while punishing his most deserving daughter and faithful servant. For King Lear, up is down, truth becomes a lie and justice is ill served by irrationality. Such madness brings chaos to a once orderly kingdom. Are there parallels in our culture? Indeed! In chaos the fool becomes a king and the king, a fool. 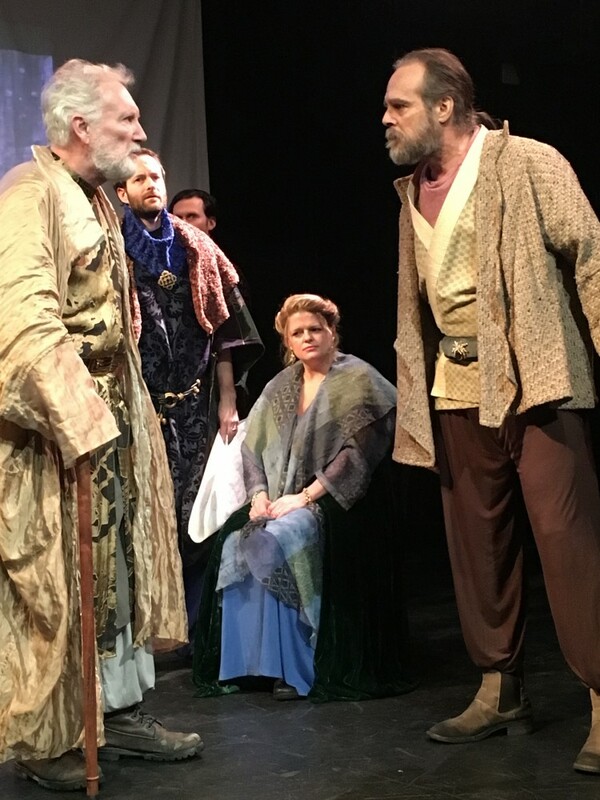 It is from this approach that The Fool’s Lear presented by an Oldest Boys Production in association with Accidental Repertory Theater takes flight and shines. Ably adapting Shakespeare’s King Lear, H. Clark Kee (who also directs) highlights the most salient themes and turning points of the play, emphasizing that in foolishness is great wisdom. Kee pairs down Shakespeare’s Lear to its essential plot points. The adaptation identifies the great conflicts between Lear and his daughters, and in the parallel plot of Gloucester and his two sons. As a result we cannot help but realize that the position of authority and power must be maintained assiduously with insight and justice. Lear’s terrible error in bestowing honors upon the most wicked is unrecoverable and unforgivable. Hence for most of the play he rages against all and blames all except himself. Only when he acknowledges his grave mistake at the point of his greatest despair, does he achieve self-realization. 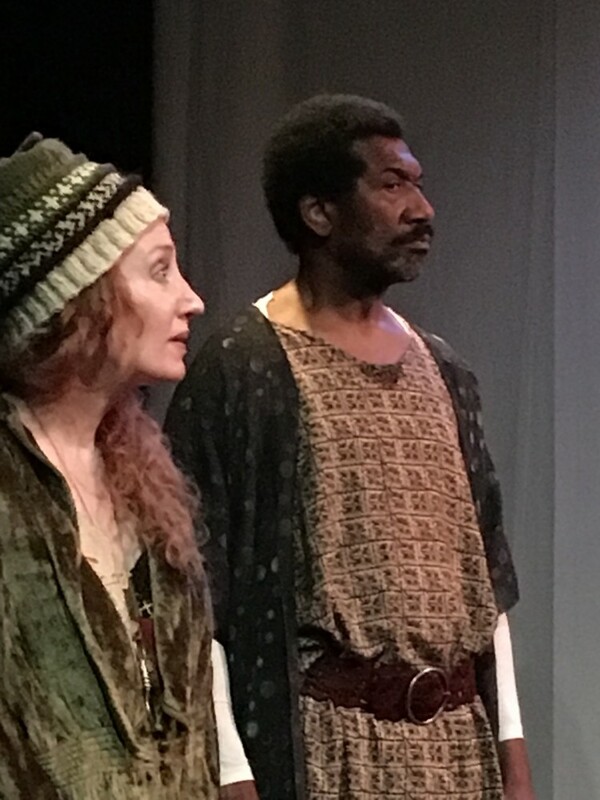 The combined effect fascinates because in presenting the story of Lear, Kee centralizes The Fool (portrayed with antic grace by Judy Krause) as key. In other productions of Lear, The Fool is an ancillary character who merely interjects humor as comic relief, Lear’s servant, a minor character giving obeisance to the king’s preeminence. However, in Kee’s production, we understand the great importance of The Fool to Lear’s well-being and ultimately his gradual restoration. Krouse’s vibrant Fool is present with King Lear throughout, not only as his servant, but as his companion, friend and conscience. The Fool’s cleverness is unparalleled. Interestingly, Kee has Judy Krause’s Fool reading Tarot Cards at the play’s outset. Hence, The Fool knows what is foreshadowed in Lear’s fateful decision. And The Fool notes that Lear’s pride in misreading honorable Cordelia’s lukewarm love response is Lear’s fatal flaw. From that point onward, The Fool in effect changes places with Lear. The king becomes more and more foolish and lunatic, prompting The Fool’s responses to be witty, sage and brilliant. Indeed, when The Fool cleverly upbraids Lear for his wrong-headed thinking, this begins his subtle instruction as Lear’s teacher. Though he might have run off and sought his keep elsewhere, The Fool is Lear’s greatest of confidantes and indeed a lover of Lear’s soul. For with jokes and merriment laden with wisdom, The Fool shepherds Lear through his most perilous journey on land, and through the most terrible storms of his mind and spirit (symbolized by the natural elements). Only when Lear befriends another lunatic in Old Tom (the excellent Fariaz Rabbiani) who is the banished Edgar in disguise, does he begin to find comfort in empathy. The Fool, for her part sees and knows the truth and “goes whither her master goes” demonstrating the most kingly of leadership behaviors, wisdom, patience, kindness, love. 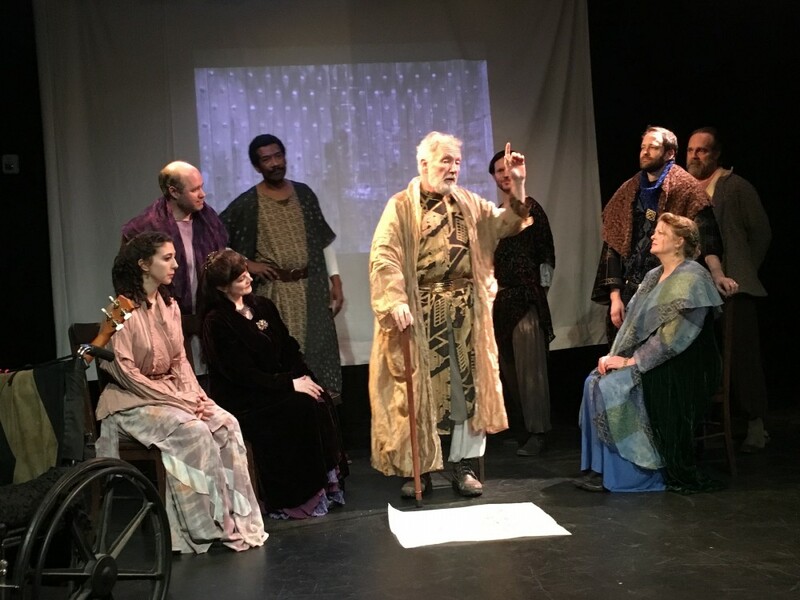 Kee’s approach toward the story of Lear in The Fool’s Lear is inspired as is the talented, adroit ensemble, headed up by Robert G. McKay as Gloucester, Joe Penczak as Kent, Brian Heuer as Edmund, Elizabeth A. Bell as Goneril, Virginia Armitage as Regan, Mike Roche as Albany, Sean Demers as Cornwall, George Spelvin as Oswald with Ross Pivec as Standby/Gloucester.